I took a trip down memory lane recently when I stumbled on You Can Surf The Net!, an internet how-to guide from 1995, on the free table at a local book faire. Three or four people ahead of me jokingly picked it up, chuckled for a minute, and walked away. I couldn’t leave the poor old book behind, dooming it to the recycling bin. This book is history, a 150-page tome littered with terms from a time where the internet was such an obscure, new thing that it was necessary to publish physical books about what it was and how to use it. It needs to be shared. “Don’t worry,” the books tells me. “You have to really mess up to get flamed.” Really, all you have to do to get into a flame war is mildly disagree with someone. Did you know there was an emoticon-smiley for Robocop? I didn’t, but now I’m going to use it all the time. “Hey Sean, how are you feeling today? “ |-]. For several pages the book catalogs hyper-specific internet lingo and TLAs, or “three-letter acronyms.” It’s all very PG: WTF and LMAO are nowhere to be found, but FWIW, the more family-friendly LMHO (laughing my head off) and LOL are here. Those are just as good. NALOPKT. 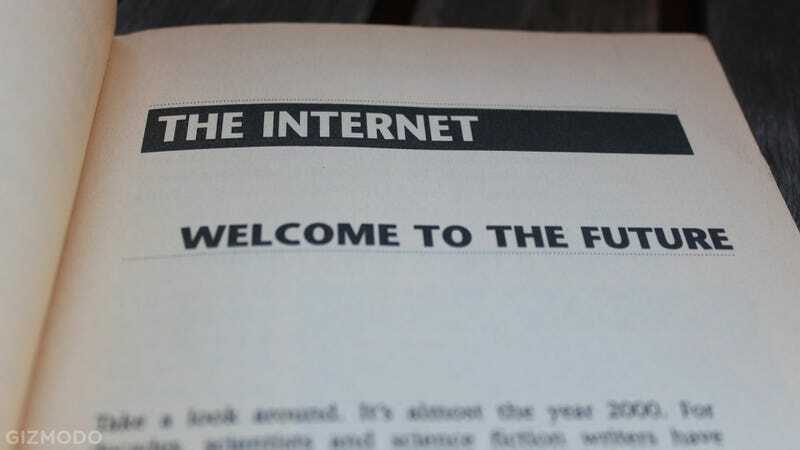 To be fair, this tutorial in etiquette (or “nettiqute,” as the book very purposefully says) is here with good reason: Back in the day, a lot of your online interaction happened in usenet newsgroups, and these forums had their own strict rules. A lot of the tips directly address things I remember being annoyed with back in the 90s. It’s true, you really shouldn’t overuse caps lock. It’s pretty telling that almost half the book is dedicated to simply listing websites. I’m serious: After the book tells you how buy a modem, find an ISP, set up a computer (with instructions for PC, Mac, Amiga and, of all things Atari systems) and get online, things rapidly devolve into lists of chatrooms, websites and things to do. Need a Newsgroup to keep up with Power Rangers, Brad Pitt and Sonic The Hedgehog fan-fiction? All of it, right here. Star Trek: Generations, Toy Story and Star Wars trivia? Yup, that’s the 90s. Not to mention chatrooms galore, including the legendary alt.cows.moo.moo.moo. A/S/L? Joke’s on him; it’s 20 years later and both the Klingon Language Institute and Charlie’s Sneaker Pages are still around. If you really want to get a personal, hands-on feel for how far we’ve come, pick up a copy. Seriously, it goes for like a penny on Amazon. You can afford it.